The polar vortex may have subsided, but the questions and concerns it raised about how to stay safe while working in freezing conditions have not. We’ve covered hot work and staying safe in the heat and are now here to help you keep your cool (pun intended) while doing cold work. OpenSesame offers more than dozen courses to keep you safe no matter what the winter weather throws at you! Need good all around winter safety training? This course is for you! You’ll learn how to plan ahead for and identify potential hazards while avoiding dangerous situations that occur during the winter season. Nervous about getting to work in the snow? I know I am (and I’m on a bike!). With a focus on defensive driving techniques, vehicle maintenance, and potential hazards of varying weather patterns, this course will help you prepare for a wintery commute so you can make it to the office or job site safely. If your job involved walking outdoors (whether you’re simply walking from the parking lot to your office or spending the whole day in the snow and ice), this course will prepare you for any winter walking situation. Note: it’s winter walking, not running. We recommend taking it slow! So your line of work requires you to be outside in cold weather. It’s smart to get wise to the hazards cold work can pose, including hypothermia and frostbite. This course will also teach you about personal protective equipment/clothing and cold injury related first aid. If a cold related emergency occurred at your workplace, would you know how to respond? After training with this course, you will! You’ll learn not only the best response, but also how to identify hazards and prevent injury. This OSHA certified course seeks to reduce the financial and personnel costs of personal injury caused by heat or cold illness and reduce the number of lost work days and amount of lost productivity. These are but a few of the courses offered on OpenSesame to train you and your employees on cold work and the dangers of winter weather. Want more options? Check out these other great courses: Cold Stress, Safety: Heat and Cold Stress Control Procedures, Cold Stress: First Aid, Cold Stress for Employees, Cold Stress for Employers, Driving in Extreme Weather Conditions, and Master Driver: Extreme Weather Conditions. 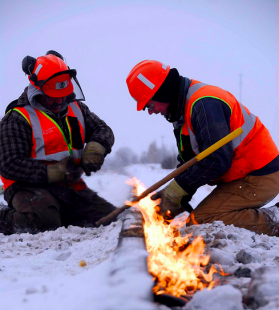 How do you deal with winter weather as it impacts your job? Let us know in the comments!